Day 2 of the Simplifying Video (p) Project. The kiddos need to write a script and record themselves describing how to simplify a complicated expression with algebra tiles. Having practiced using the script on Tuesday, writing the actual script on Wednesday, today is filming day. It is also a short day; we have professional development after school where we look through our departments’ scopes and sequences. And I am out tomorrow for a personal day. Some of the kiddos have done this last year. We’ve made the prompt a bit more sophisticated and there are more extensions. We’re able to record a video in Arabic and in Portuguese. The video in Mandarin gets lost in the shuffle. One of my advisees arrives for the first time in about a week. I basically hover their shoulder for the last 10 minutes of class. Our video is as much my voice as his voice. I regret it a little bit, but I also want him to not fail. He is able to name the different tiles and is able to make zero (though he requires help to do it in the actual video). After class, I make him sit for an exam that he missed. He actually does OK, having missed quite a few days of school. He will get a D on his marking period grades instead of an F.
There’s a pause missing from this title, I know it. Edit: went back and fixed it. It’s getting to the end of our simplifying unit (which extends into other units, later on, hence the shortness). Some kiddos need more practice. Some have already seen this. We do individual practice, which means lots of little papers everywhere. I also miscalculate (many times) and make up to 4 times as many copies as needed. Lots of paper. Big takeaway from this unit is that area and perimeter are a great way to encourage simplifying expressions in a realesque setting. 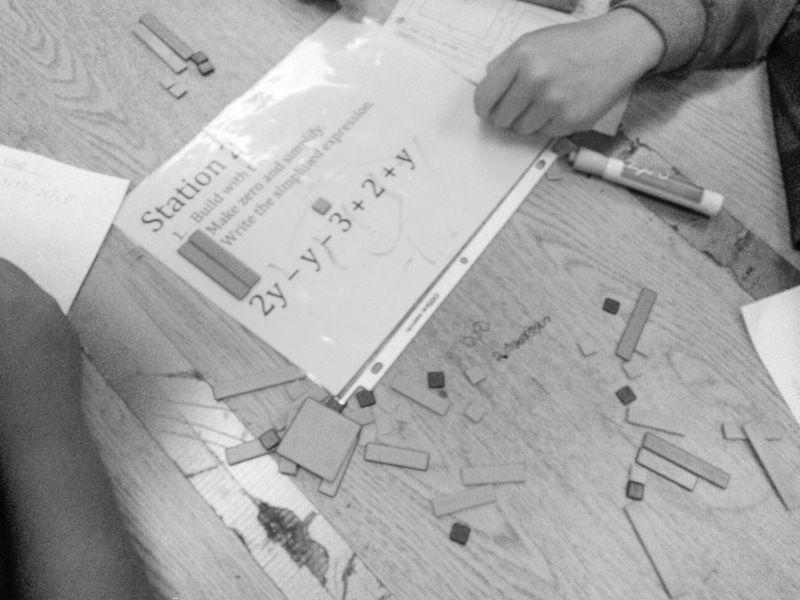 In an effort to keep kiddos engaged while practicing problems that are quick with a new twist (expression papers, with an opposite section), we rotate through stations. This time, we include a participation quiz, where we highlight the good things that kiddos are doing. I thought I took a better video of this (I didn’t), but this is one of the kiddos explaining to another how to simplify expressions. Many representations. And a ton of empathy. Strong work. Last year, our Admin gave us the option to request a certain prep period. Curriculum Partner and I have always had 2nd period prep, which suited us well as relatively new planning partners with a new curriculum. When things went south in 1st period, we’d huddle (usually during prep, sometimes in each other’s classrooms or the hallway during 1st period) and make up a new lesson. I dreamt of having a later prep period this year. I’m more of a morning teacher, kiddos are calmer, and by after lunch, we’re all done. We ended up with 2nd period prep, again. Which was cool. It got even better today. Give instructions and distribute papers. Check-in with kiddo outside in hall. Answer phone call from office politely inquiring as to the nature of the meltdown. So, during 2nd period, we scrapped the whole lesson. Curriculum Partner drew up a problem were kiddos explain different kinds of problems to each other and we turned the initial handouts into a series of Secret Problems. One kiddo is the teacher. They read a problem to the rest of the team. The team builds the expression. The kiddo/teacher checks to make sure it’s right, then lets the next person teach a different problem. We’ve had varying levels of success in prior years, but it went well on this day as kiddos knew enough to move their teams along. Also, there was a fire drill during prep. Just because. Probably worth mentioning that the reason we did an area reading guide was to prepare for simplifying expressions via Algebra Tiles (which names tiles based on their area). We do a variation of this unit every year and it’s fascinating to see how it changes. 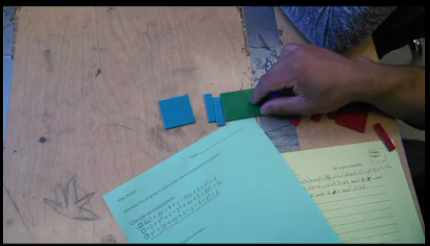 This year’s model is based on the “See Variations of Things Many Times” to try it from all angles and expose the kiddos to a couple ways of thinking about it.